No Carb Instead OF Low Carb? Why is the Keto diet so effective? After Low Carb comes No Carb: In the ketogenic diet, carbohydrates are banished from the plate. How fast you can reduce it and how healthy the diet is, we clarify here. In this article, we clarify the most important questions on the topic of No Carb Diet and the ketogenic nutrition. Everyone is talking about the keto diet – but what’s behind it? Finally, the new edition of a well-known (and proven) method: reduce carbohydrates and lose weight. After fat fattening for a long time, Robert Atkins revolutionized the world of weight loss in the 1970s with the first low-carb diet. It was followed by Logi, Dukan – and now Keto. The name “keto” derives from the principle that applies to all these diets: to give the body as little carbohydrates as possible in order to bring it into the state of ketosis. This means that it draws his energy from fat and not – as otherwise preferred – from carbohydrates. As the carbs disappear from the plate, proteins and fats are increasingly being used. What is the difference between keto and low carb diet? The ketogenic nutritional principle is one of the low carb diets but goes one step further: According to the motto “Much brings much” carbohydrates are radically deleted from the diet. That’s why the keto diet is called the No Carb Diet, which means that not a few (50 to 120 grams per day) of carbohydrates are eaten, but virtually none (below 50 grams per day). So the body switches even faster (and more constant) in the ketosis mode. However since ketosis is not a natural condition for the organism and the metabolism has to get used to it, there is a lot to consider. Otherwise, the fat melt becomes a problem. Your metabolism loves sugar because from the simple sugar glucose it gains the fastest energy. The brain, in particular, relies on glucose because proteins and fats can not cross the blood-brain barrier. The problem: an excess of sugar will be stored in the body. So eat more carbohydrates regularly than you need, your body converts them into fat and stores them for bad times – hello hip fat! Keto opposes that. The No Carb principle goes back to a protective mechanism of the brain. It starts when there are not enough carbohydrates available. Then your body is forced to resort to the fat reserves instead. The official definition is: “A metabolic state in which the concentration of ketone bodies in the blood is elevated above normal levels”. The ketosis occurs as soon as the insulin value falls below a certain level because then arise from fat cells free fatty acids and said ketone body. These ketone bodies are essential for survival, because from them also the brain can gain energy. In the meantime, even scientists are arguing whether this metabolic pathway could not be the most efficient one for the human body. However, the body has to adapt to these changes and the new “fat metabolism” first. In the transitional period, symptoms of the so-called “low-carb flu”, such as headache, fatigue, and weakness, are common. How long the body needs to get used to the new metabolism depends on you, your age and general health. In summary, if we do not provide glucose to our bodies, they will inevitably have to change their metabolism to gain energy from fat / fat reserves. Excess body fat is broken down while maintaining muscle mass. In the ketogenic diet, it is not necessary to go hungry but to do without it. The most extreme form of the keto diet was conducted under clinical conditions, delivering 9:1 fat and protein and zero carbohydrates. The moderate form of 30 to 50 grams of carbs per day is permanently feasible, but you have to be the type for it. It becomes difficult as a pasta and bread junkie. A permanent, extreme reduction to 0 to 20 grams of carbs per day can quickly lead to medical complications. The exact macronutrient distribution depends not only on the weight but also on the goal, the activity, and the previous diet. The optimal distribution is around 65 to 70 percent fat, at best from red meat and high-fat fish, 20 to 30 percent Eggs made from eggs and lean poultry meat and 5 to 10 percent carbohydrates. With the keto diet, you should, in any case, take less than 50 grams of carbs per day, optimally 20 grams. The beginning is always the hardest part – including the introduction to the keto diet. In order to achieve really good results with the ketogenic diet, you have to know exactly how many carbs, proteins and fat each food contains. And that’s not so easy. Fat plays an important role in the keto diet and should, as already mentioned, account for up to 70 percent of your daily diet. It is both polyunsaturated and monounsaturated, and saturated fatty acids allowed. The best are fish (tuna, salmon, anchovies, sea bream, trout), vegetable oils (olive oil, coconut oil, butter, avocado oil, macadamia oil, mayonnaise, cream, lard), numerous nuts, cheese, and sausages. The only grease you cannot touch is industrial fat, so-called trans fatty acids. However, as they are mostly found in deep-fried or ready meals, you do not have to worry about it. Fries, frozen pizza and chips are taboo anyway. Some high-fat foods are also good sources of protein, which should also be on the daily keto diet: meat (beef, huh, game, sausage, ham, hamburger, bacon), eggs and of course the above fish species. Obviously, you should not miss vegetables and fruits in your diet – even during the keto diet. The stupid thing is that many vegetables and fruits contain plenty of starch (multiple sugars) or fructose. Prohibited are therefore potatoes and potato products, legumes (such as chickpeas, soy, lentils & co) and most types of fruit. For fruits, you should limit yourself to avocados and berries of all kinds, which contain little fructose. Pumpkin, carrot and sweet potato should be on the menu only exceptionally, as they contain many carbs compared to other vegetables. 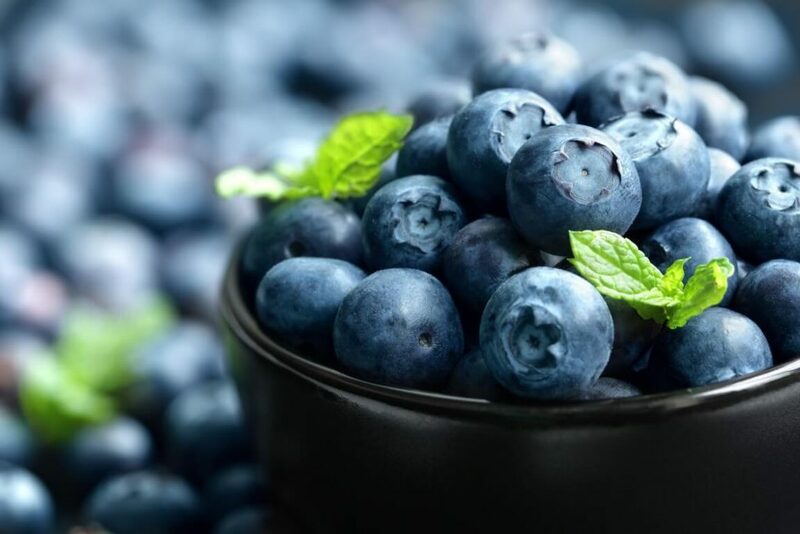 Berries contain little fructose compared to all other types of fruit. Focus on vegetables with salads and green leafy vegetables, such as spinach. Cabbage is also keto – so broccoli, cauliflower, white and red cabbage, kohlrabi & co. are allowed. 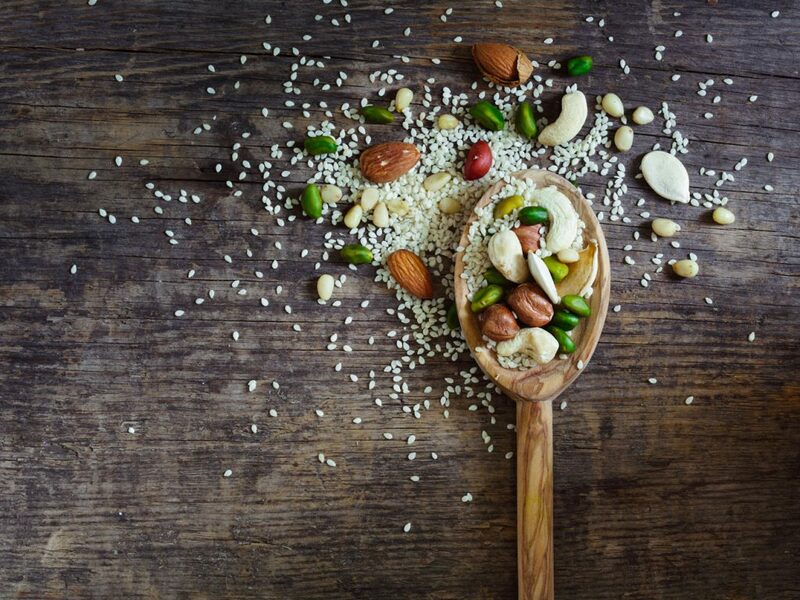 Nuts and kernels, such as Brazil nuts, macadamia, hazelnuts, chia seeds, flax seeds and pumpkin seeds are allowed at Keto. But beware: nuts provide plenty of fat and protein, but also some carbs, so you should always pay attention to the portion size. Walnuts, cashews, but also pistachios and peanuts provide quite a lot of carbohydrates and should only be consumed in moderation. Dried fruit is taboo. In the keto cooking, almond or coconut flour substitute the wheat flour. All other flours, including whole grains, are taboo. As well as couscous, bulgur, corn, pasta, cornflakes, oatmeal, rice, rye and co. Allowed sweeteners are sucralose, erythritol, xylitol and stevia. Sugar, agave syrup, artificial sweeteners, syrup and any other sweeties (ice cream, biscuits & Co.) are unfortunately taboo. As keto-compliant drinks are water, tea, and coffee without milk (cream ok). Absolute No Go are energy drinks, alcoholic drinks, light drinks, fruit or vegetable juices, and soft drinks. How do I know how many carbohydrates are in the food? It is very difficult for you to find out how many carbohydrates are really in your food. This only helps meticulous weighing and to study the respective nutritional value composition. For packaged groceries from the supermarket, you have it easier. On the back, you will always find an overview of the nutrients. However, you should orient yourself by the specifications per 100 grams. It gets more difficult with fresh ingredients. If you really want to know exactly, there is only looking and calculating. You know the most important basics of the keto diet now, but how well can the low-carbohydrate diet be implemented in practice? For the ketosis to be able to use at all, all carbohydrate reserves in the muscle cells and the liver must first be used up. On average, this takes about 4 days from the time the carbohydrates are reduced to less than 30 grams per day. In these first days of familiarization, the mood may suffer a bit, one often feels powerless, tired and irritable. It really starts on day 5: The body begins to signal the metabolism, break up the fat reserves. Free fatty acids and ketone bodies are created for the brain, muscles, and organs as alternative energy sources. Here, however, there is a difficulty that does not exist with any other diet: Small sins are punished immediately in the keto diet (!). “Even 1 apple with 20 grams of carbohydrate without fat and protein leads to such a large insulin release that you fall out of the ketosis,” says a nutritionist. There are studies that associate the diet with the relief of epilepsy, Alzheimer’s and type 2 diabetes. Many study participants also report that they feel fitter and happier with ketone bodies instead of carbohydrates. Despite or even because of the big hype experts also warn of potential risks, because the diet is nothing but an extreme form of low-carb – and this can always have negative effects. In addition, the body may be too acidic quickly and with prolonged use, the blood levels can worsen. With an excess of ketone bodies in the blood, the pH can drastically change, which in the worst case can be life-threatening. Conclusion: Listen to your body, not the scale! The ketogenic diet has its advantages and disadvantages: the iron element is particularly in demand during the familiarization phase. Due to the lack of carbohydrates, you can be initially irritable, tired and powerless. But the first results will not be long in coming. However, the range of permitted foods is limited, which makes the keto diet is not just “every day”. The health disadvantages are not to be dismissed. The promise to lose fat is never worth risking health. So pay attention to the signals of your body! These 20 types of fruit make you slim.